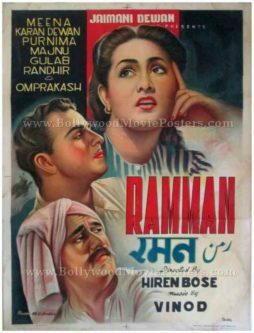 Classic hand drawn Bollywood movie poster of the Hindi film, Ramman (1954) for sale. This is an actual surviving original vintage hand painted Bollywood movie poster of the 1954 Hindi film that featured Meena and Karan Dewan in lead roles. Printed and circulated during the first release run of the film (early 1950s), this old hand painted Bollywood movie poster was originally designed for publicity of the film but never ended up being used. This hand painted Hindi movie poster was originally hand drawn on canvas by a leading poster design studio in Bombay. Brilliant hand painted portraits of the lead actors are seen prominently on the top and center of the poster, while a hand drawn portrait of supporting actor Om Prakash appears at the bottom. This hand painted Bollywood poster is an original lithographic print and bears the name of the lithographer at the bottom.